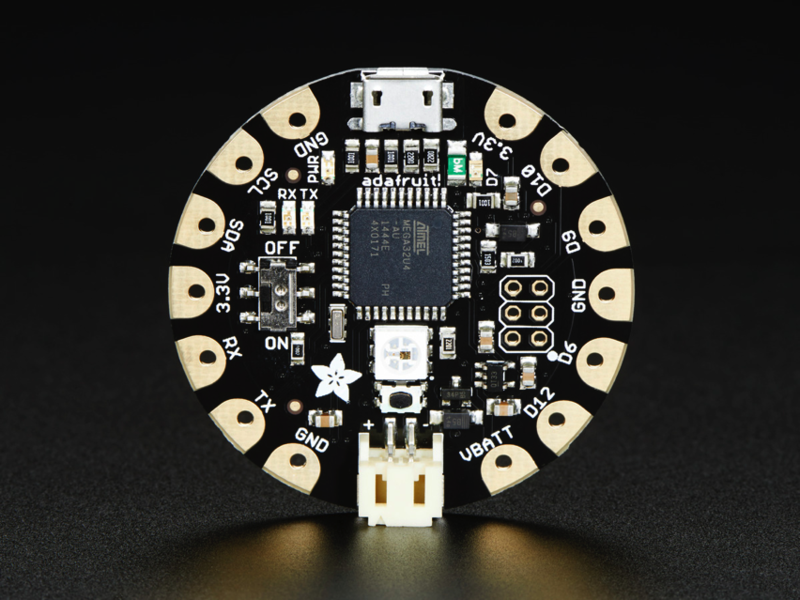 I was reading hackaday review about Orange PI (small single board linux computer. And in the comments they were talking about mis-aligned ICs. Some claimed it is bad, some claimed it is optimized. Most just say it looks weird and drives them crazy. I have no experience in electrics design, but this is my first time to see such strangely oriented components! Is this rotation good or bad? Does it matter? Why would the PCB designer orient some of the chips like this? One significant reason for placing larger components on angles is how that affects the routability of the board. Because SMT parts won't normally allow you to pass a trace between pads, the requirement to use vias and tunnel under has become much more prevalent. However that requirement has always caused an area where you can no longer add vias as shown in the triangular area under the left chip. Vias themselves are usually placed on a 45 degree angle relative to the track axis so as to maintain the track spacing while allowing the via pad to be larger than the track width. By rotating the chip to also be at 45 degrees you can get rid of that triangular no-via zone leaving a lot more room to bring in and connect the remaining traces to the device. Whether the board shown in the OP's question was done for this reason, or to balance line lengths etc, who knows. However I suspect it was mostly done just because they could and thought it was cool. It doesn't matter. In fact (all other things being equal) I'd hire this PCB designer before the person who persevered with a traditional orthogonal layout that made the job harder, longer & more expensive. There's no law of PCB design that says chips need to be aligned orthogonally. That's just a faux-OCD thing that geeks suffer from. A long time ago it wasn't easy to orient components on the PCB other than orthogonally, but those days are long past; modern EDA packages allow component rotation to be specified in degrees, at least. Similarly, and more recently, many component pick-n-place machines wouldn't be able to rotate components that much to place them down onto the board (prior to being reflow-soldered), but for modern electronics manufactured in countless modern facilities, this too isn't a common constraint any more - demonstrably. 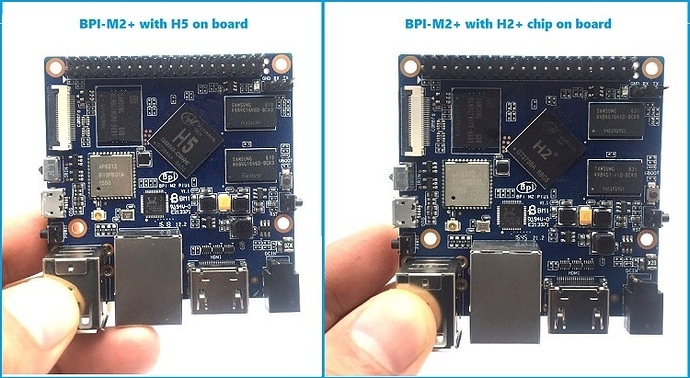 The reason for doing it is to achieve a more easily routable PCB from the perspective of the length of traces between the main SoC and the two DDR3 RAM chips. 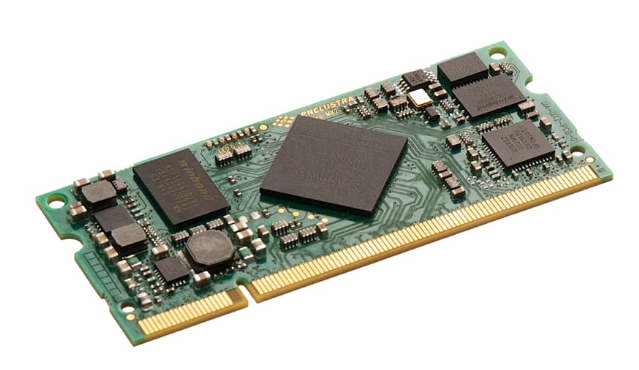 DDR3 runs at rather high frequencies, but particularly with tight timing across the various signals. The length of a trace determines how long it takes for the wave-front of the rising/falling edge of the digital signals to reach its destination. If they arrive at different times (relative to each other, or to a common clock signal) beyond narrow windows of tolerance, things stop working. It's not just about the length of the traces or the distance between the chips, either, but chip orientation and relative placement will impact how much effort needs to be put into the routing. Some arrangements will maximise the disparity; others will drastically minimise it, particularly if the SoC designers have targeted specific family(s) of RAM chips that have specific pin-outs, and arranged the pinout of their SoC to make it easier for the PCB designer, rather than harder. See all those squiggly tracks? 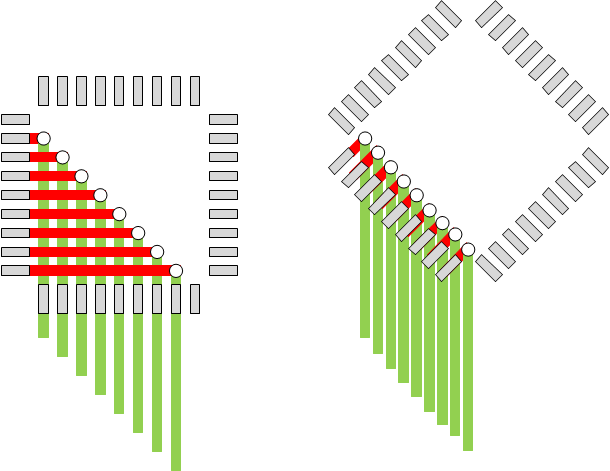 That's what you have to do to make sure all the signals travel the same length, to ensure they arrive at the other chip at the right time. It's a friggen PITA. 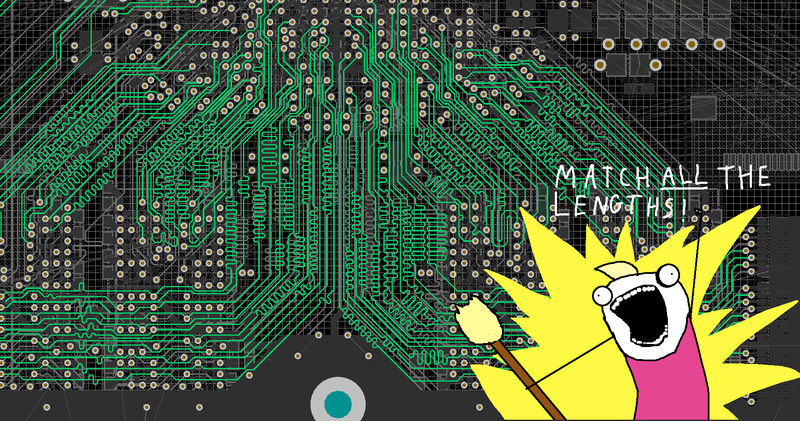 "Look, I'm sick of all this track length-matching pain, so I'm gonna locate the Soc and the two DDR3 RAM chips optimally relative to each other to minimise length differences, then route that sucker with the least amount of squiggly traces, and then plonk that trio of chips including the routed tracks down onto the PCB in an arbitrary orientation which then makes room for the other chips on the PCB, given edge connector constraints. Boom." Routing the trio outside the PCB's constraints isn't even compulsory, either, it can be done after component placement is 100% locked in. 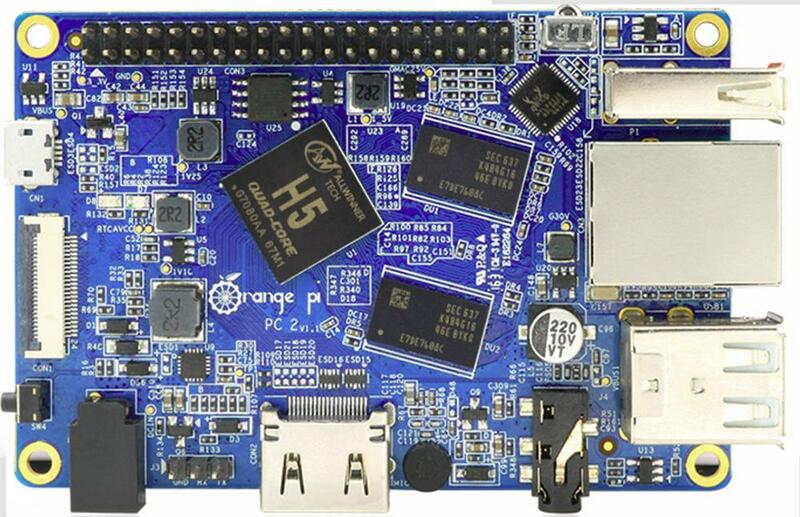 I also suspect the designers of the Orange Pi thought "Hey, this'll get the hobbyists all in a tizz!". And so it did. I salute them. Nor is it the first time they've oriented things to make their lives easier. 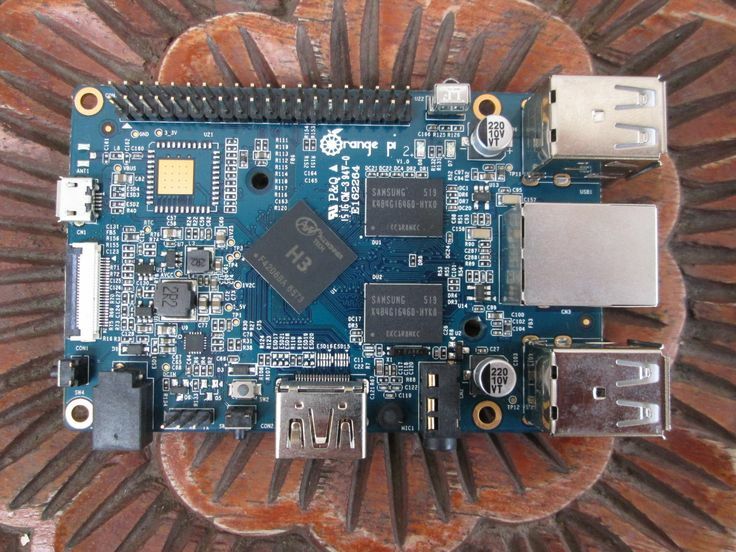 Same with the Banana Pi. Not the answer you're looking for? Browse other questions tagged pcb-design integrated-circuit schematics or ask your own question. When is it appropriate to mount components at a 45 degree angle?